• Legibility - use of 'mini home page' on every subsequent page, same menu on every page, site map. However, it should be borne in mind that such generalisations can be misleading based on the methodology used. Reported behaviour (e.g. through questionnaires or focus groups) may be quite different from actual observed behaviour. Leading e-retail sites (for example Amazon.com and eBay.com) and many media sites typically have a large amount of information and navigation choices available on-screen since the site designers know from testing alternative designs that consumers are quite capable of finding content relevant to them and that a wider choice of links means that the user can find the information they need without clicking through a hierarchy. When performing a real-life product search, in-depth information on the products and reviews of the product are important in making the product decision and are one of the benefits that online channels can give. Although design look is top of the list of factors presented by Fogg et al. (2003), you can see that many of the other factors are based on the quality of information. In the following coverage, we will review the general factors which designers consider in designing the style, organisation and navigation schemes for the site. An effective web site design will have a style that is communicated through use of colour, images, typography and layout. This should support the way a product is positioned or its brand. The style elements can be combined to develop a personality for a site. We could describe a site's personality in the same way we can describe people, such as 'formal' or 'fun'. This personality has to be consistent with the needs of the target audience (Figure 7.9). 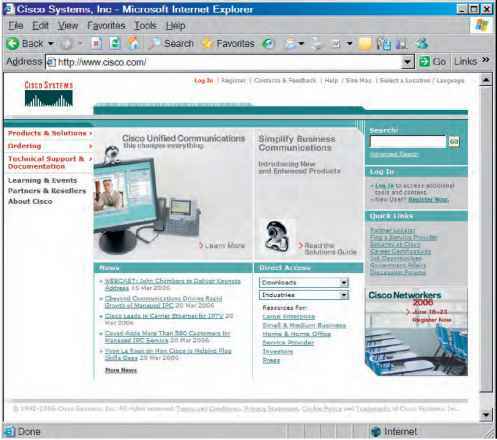 A business audience often requires detailed information and prefers an information-intensive style such as that of the Cisco site (Figure 7.12) (www.cisco.com). 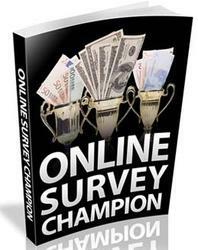 A consumer site is usually more graphically intensive. Before the designers pass on their creative designs to developers, they also need to consider the constraints on the user experience, such as screen resolution and colour depth, browser used and download speed. • The speed of downloading graphics - designers need to allow for home users who view sites using a slow modem across a phone line and who are unlikely to wait minutes to view a web site. • The screen resolutions of the computer - designing for different screen resolutions is necessary, since some users with laptops may be operating at a low resolution such as 640 by 480 pixels, the majority at a resolution of 800 by 600 pixels, and a few at higher resolutions of 1064 by 768 pixels or greater. • The number of colours on screen - some users may have monitors capable of displaying 16 million colours giving photo-realism, while other may have only 256 colours. 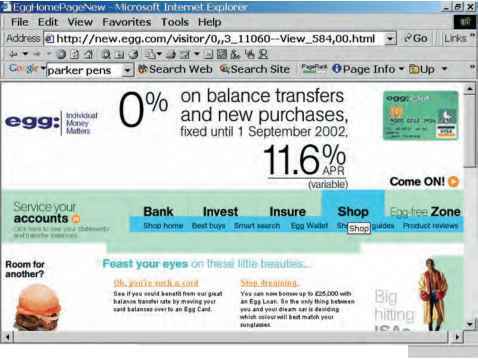 • The type of web browser used - different browsers such as Microsoft Internet Explorer and Netscape Navigator and different versions of browsers such as version 4.0 or 5.0 may display graphics or text slightly differently or may support different plug-ins (see the section in Chapter 9 on testing). denominator problem' since this is what the designer must do - design for the old browsers, using slow links and low screen resolutions. One method for avoiding the 'lowest common denominator problem' is to offer the user a 'high-tech' or 'low-tech' choice: one for users with fast connections and high screen resolutions, and another for users who do not have these. This facility is mainly seen offered on sites produced by large companies since it requires more investment to effectively duplicate the site. Despite these constraints, graphic design is important in determining the feel or character of a site. The graphic design can help shape the user's experience of a site and should be consistent with the brand involved. In their book Information Architecture for the World Wide Web, Rosenfeld and Morville (2002) identify several different information organisation schemes. These can be applied for different aspects of e-commerce sites, from the whole site through to different parts of the site. 1 Exact. Here information can be naturally indexed. If we take the example of books, these can be alphabetical, by author or title; chronological - by date; or for travel books, for example, geographical - by place. Information on an e-commerce site may be presented alphabetically, but it is not suitable for browsing. 2 Ambiguous. Here the information requires classification, again taking the examples of books, the Dewey Decimal System is an ambiguous classification scheme since the librarians classify books into arbitrary categories. Such an approach is common on an e-commerce site since products and services can be classified in different ways. Other ambiguous information organisation schemes that are commonly used on web sites are where content is broken down by topic, by task or by audience. The use of metaphors is also common, a metaphor being where the web site corresponds to a familiar real-world situation. The Microsoft Windows Explorer, where information is grouped according to Folders, Files and Trash is an example of a real-world metaphor. The use of the shopping basket metaphor is widespread within e-commerce sites. It should be noted though that Nielsen (2000b) believes that metaphors can be confusing if the metaphor isn't understood immediately or is misinterpreted. 3 Hybrid. Here there will be a mixture of organisation schemes, both exact and ambiguous. Rosenfeld and Morville (2002) point out that using different approaches is common on web sites, but this can lead to confusion, because the user is not clear what mental model is being followed. We can say that it is probably best to minimise the number of information organisation schemes. Tools provided to the user to move between different information on a web site. Flow describes how easy it is for users of a site to move between the different pages of content of the site. Devising a site that is easy to use is critically dependent on the design of the site navigation scheme. Hoffman and Novak (1997) and many subsequent studies (e.g. Rettie, 2001, Smith and Sivakumar, 2004) have stressed the importance of the concept of flow in governing site usability. The concept of 'flow' was first brought to prominence by Mihaly Csikszentmihalyi, a psychology professor at the University of Chicago. In his book, Flow: The Psychology of Optimal Experience, he explains his theory that people are most happy when they are in a state of flow - a Zen-like state of total oneness with the activity at hand. In an online marketing context, 'Flow' essentially describes how easy it is for the users to find the information or experiences they need as they move from one page of the site to the next, but it also includes other interactions such as filling in on-screen forms. Rettie (2001) has suggested that the quality of navigation is one of the prerequisites for flow, although other factors are also important. They include: quick download time, alternative versions, auto-completion of forms, opportunities for interaction, navigation which creates choices, predictable navigation for control and segmenting content by Internet experience. 1 Consistency. The site will be easier to navigate if the user is presented with a consistent user interface when viewing the different parts of the site. For example, if the menu options in the support section of the site are on the left side of the screen, then they should also be on the left when the user moves to the 'news section' of the site. how easy it is to find designed site it should not be necessary to refer to such a map regularly. 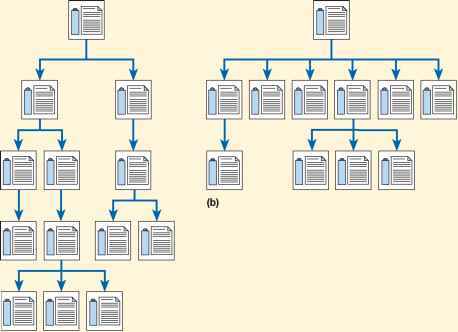 and move between different information on Most navigation systems are based upon a hierarchical site structure. When creating a web site. It is . . . . . . . .
Jakob Nielsens teriri (2000b) points out that many users will not arrive on the home page, but may be for a user arriving at a site deep within its referred from another site or according to a print or TV advert to a particular page such structure. as www.b2b.com/jancomp. He calls this process 'deep linking' and site designers should ensure that navigation and context are appropriate for users arriving on these pages. • Where am I? The user needs to know where they are on the site and this can be indicated by highlighting the current location and clear titling of pages. This can be considered as context. Consistency of menu locations on different pages is also required to aid cognition. Users also need to know where they are on the web. 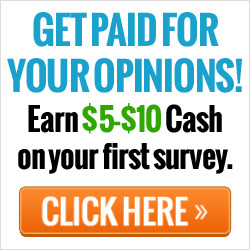 This can be indicated by a logo, which by convention is at the top or top left of a site. • Where have I been? This is difficult to indicate on a site, but for task-oriented activities such as purchasing a product it can show the user that they are at the nth stage of an operation such as making a purchase. • Where do I want to go? This is the main navigation system which gives options for future operations. To answer these questions, clear succinct labelling is required. Widely used standards such as Home, Main page, Search, Find, Browse, FAQ, Help and About Us are preferable. But for other particular labels it is useful to have what Rosenfeld and Morville (2002) call 'scope notes' - an additional explanation. These authors also argue against the use of iconic labels or pictures without corresponding text since they are open to misinterpretation and take longer to process. Since using the navigation system may not enable the user to find the information they want rapidly, alternatives have to be provided by the site designers. These alternatives include search, advanced search, browse and site map facilities. Whatis.com (www.whatis.com) illustrates these features well. Designing and creating the menus to support navigation present several options, and these are briefly described here. The main options are the following. The site user can select menus by clicking on different objects. They can click on a basic text hyperlink, underlined in blue, by default. It should be noted that these will be of different sizes according to the size the user has selected to display the text. The use of text menus only may make a site look primitive and reduce its graphic appeal. Rectangular or oval buttons can be used to highlight menu options more distinctly. Images can also be used to show menu options. For instance, customer service could be denoted by a picture of a helpdesk. Whilst these are graphically appealing it may not be obvious that they are menu options until the user positions the mouse over them. A combination of text menu options and either buttons or images is usually the best compromise. This way users have the visual appeal of buttons or images, but also the faster option of text - they can select these menus if they are waiting for graphical elements to load, or if the images are turned off in the web browser. However, icons should have the advantage that their understanding is not language-dependent. 'Rollover' is the term used to describe colour changes - where the colour of the menu option changes when the user positions the mouse over the menu option and then changes again when the menu option is selected. Rollovers are useful in that they help achieve the context referred to in the previous section, by highlighting the area of the site the user is in. Menus can be positioned at any of the edges of the screen, with left, bottom or top being conventional for Western cultures. The main design aim is to keep the position consistent between different parts of the site. Frames are a feature of HTML which enable menus to be positioned at one side of the screen in a small area (frame) while the content of the page is displayed in the main frame. Frames have their advocates and detractors, but they are still used on some sites (e.g. 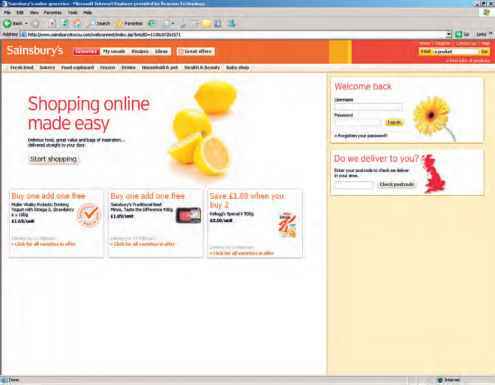 www.tesco.com) which require particular functionality. Detractors point to poor display speed, difficulties in indexing content in search engines and inflexibility on positioning. Psychologists recommend having a limited number of choices within each menu. If a menu has more than seven, it is probably necessary to add another level to the hierarchy to accommodate the extra choices.